Bend tables are a more reliable way to express material deformation properties than K-Factor. When you physically bend a flat sheet of a particular material, you can measure its length before and after this process. You can repeat this procedure for different bend angles, bend radius, and sheet thickness and save the measurements in a bend table. Then these measurements can be taken into account to compute the correct unfolded length for all parts made of the same material. In a bend table, you can add the measurements for as many different bend angles as you want. However, in most cases it suffices to measure the length for a 90 degrees angle. BricsCAD will automatically compute the length for other bend angles using a reliable interpolation technique. Bend tables are stored in a *.csv (comma separated values) file format. You can create such a table in an ASCII text editor, such as Notepad, but a more reliable and easier way is to create a table in a spreadsheet, such as Microsoft Excel or LibreOffice and then export it to .csv file format. The content of the first cell reads "BricsCAD”. Version: currently supported version is 1. In depth: methodics to compute tangential bend deduction for acute and obtuse angles. Within the defined header, several tables can exist. For each table, the first key is the of the sheet metal part, the second key, DieWidth, is optional. The Thickness / DieWidth pairs must be unique. If the DieWidth is not defined, only one unique Thickness value key is allowed, but multiple thickness values can be added. When a bend table is used to control the unfolding process, the Thickness and DieWidth , defined in the sheet metal part, must exist in the bend table. If the table is not found the default K-Factor policy is used. T = 1, R = 2, A = 45. Then after unfolding it will obtain the BD = 0.466, because both R and A are found in the bend table for the given thickness. T = 1, R = 2.5, A = 45. A = 45 is found, but R = 2.5 is missing: the interpolation of BD between R=2 and R=3 is used. T = 1, R = 2.5, A = 75. 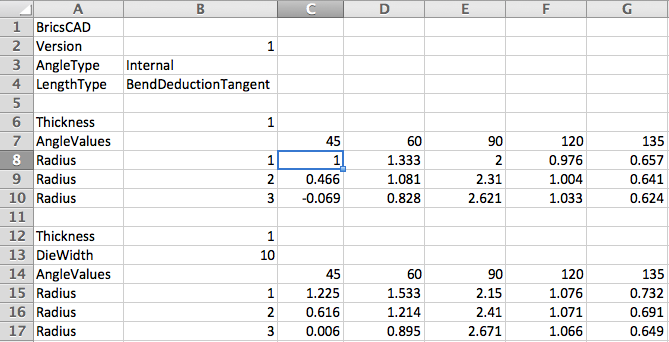 Neither R nor A is found in the table: the following cells are used to calculate the value of BD: (R=2, A=60), (R=3, A=60), (R=2, A=90) and (R=3, A=90). The top-of-the-edge algorithm is used to calculate the interpolation. For example, linear interpolation on adjacent BD values render unnatural results, which will not match the real bending results. Also keep in mind that for a given T, R and A not all BD values make sense: a random one might place the neutral surface outside the sheet metal part, or expressed in K-Factor (which can be deduced from BD), the K-Factor can be out of range [0, 1]. In this case, the BD for the default K-Factor will be used. If you produce your sheet metal parts with different tools, you can describe them in one bend table using DieWidth parameter. A sample bend table is provided for your convenience in the [BricsCAD Installation folder]\Samples\Mechanical\bend_tables. Please notice that writing rights to this folder might be limited. In such case you need to copy the bend tables to a different folder in which you have full access rights. Select the root node in the Mechanical Browser. 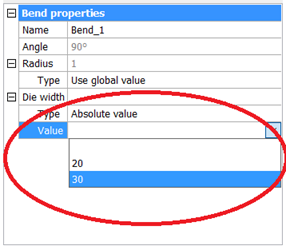 Select the Bend table field. Click the Browse button ( ). Select the *.csv file then double click or press the Open button. Press the Update button ( ). 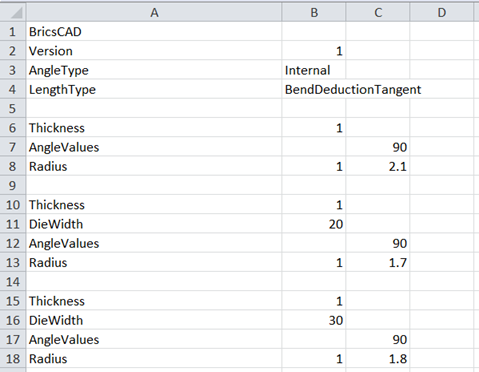 Select .csv file DieWidth secondary keys and thickness matching the current part. On given example we assume that part has thickness of 1 mm and bend radius also equals to 1. We will vary bend deduction to different tools: the first subtable is when the tool is not specified, second subtable is for the case when tool DieWidth is equal to 20, and the last one is for a tool with DieWidth equal to 30. Assign the bend table to the sheet metal part. With the given selection, an unfolding of Bend_1 will use a third subtable from our bend table for bend deduction and uses the value 1.8. 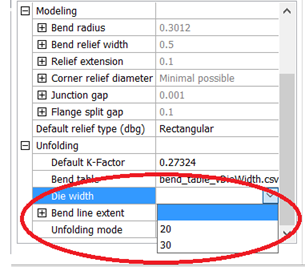 For the rest of the bends, unless DieWidth is set for them, the default no-die-width value will be used, which will trigger first the bend table and uses value 2.1 for 90-degrees with a bend radius equal to 1. After assigning the DieWidth to the bends and saving the document, the value is saved to the bends. However, next time the drawing is opened, in order to assign the DieWidth value to another bend, you have to reload the bend table first (press the green arrow button), see To update the bend table set previously. 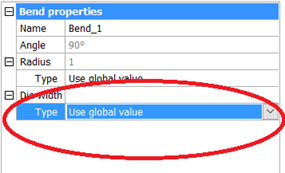 After the reload the values from the bend table will be available.